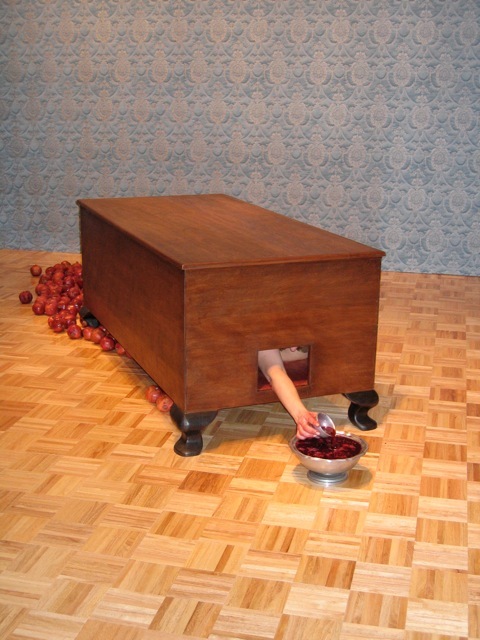 Erin V. Sotak is an installation and performance artist concerned with notions of absurdity, futility, consumption, labor, and aesthetics. Her work is best described as a moving tableau that is re-rendered through the photographic process. Sotak will fabricate a new space in the Sesnon gallery using a variety of materials including wood, wall coverings, raw silk, and pomegranates. The piece revisits ideas of constraint versus restraint, seen versus unseen, interior versus exterior, and the distinct blur of the separateness of experience that occurs in a singular shared moment. Interdimensional artist, T. S. Anand, invites her audience to experience the interface of art and life with her latest interactive work: REST. 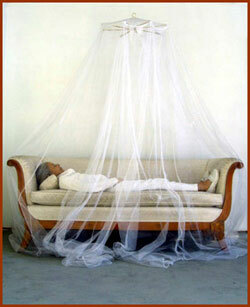 REST completes the Mosquito Net Trilogy that began with standing for the Tree Museum of Gravenhurst, Canada in 2003; continued with sitting for the Santa Cruz Institute of Contemporary Art in 2005; and culminates with performative recumbency premiering at the Sesnon Gallery, UCSC in 2007.